Riley Smith wears black high top Converse “Chuck Taylor” All Stars in the film. Shane and Danielle have a mutual attraction for each other. Four lovely coeds are out in the ocean off the Fort Lauderdale, Florida coast sitting on a rubber raft enjoying cocktails and the remains of a picnic lunch. Abby is in the water, hanging on the the edge of the raft and kicking her legs in the water. All of a sudden dun dun dun dun, dun dun dun dun, shark attack! Abby is bitten and pulled into the ocean, the raft capsizes and overturns. Those pesky sharks have returned, and just in time for spring break. And not just any old shark. These are tiger sharks which have no qualms about going after any kind of food in the water, whether it is a school of fish or party-going college students floundering in the water. Cut to northern Virginia. Danielle Harrison (Shannon Lucio) is talking to her friends Alicia (Genevieve Howard) and Karen (Bianca Lishansky) who tell her that she needs to come join them for spring break in the wonderful beach house where they are staying. But Danielle's father is very much against her going down there, so of course she goes down there. Danielle is a more serious girl than the typical spring break coed, but she also has a chance to hookup with her brother Max (Wayne Thronley) who is part of a university oceanography research team studying the marine life in the area. Danielle and Shane have a serious discussion in the moonlight. Next we are introduced to some poeple in the local business community who depend on the tourists for their livelihood. We meet John Nately (Bryan Brown), a local developer who has been building an artificial reef to change the local marine life patterns and close down a rival resort. And we meet Mary Jones (Kathy Baker) and her son Shane (Riley Smith) who run a boat rental business. Shane wants to go to college and become an engineer, but feels obligated to stay and help his widowed mom with the boat rental business. As a result he feels somewhat shy and uncomfortable around the colleges types who are in town to party. We also meet the party crowd, but other than Alicia, Karen and J.T. (Justin Baldoni), Danielle's ex-boy friend, they pretty much function as stereotypes. They are even listed in the cast list that way: Hot Girl, Blond Sorority Girl, Husky Guy, Skater Guy, and Co-eds 1, 2, and 3. And let's face it, their main purpose is to provide us with a continuous visual tapestry of hot chicks and buff guys wearing very little clothing. The fact that most of the characters are stereotypes takes you off the emotional hook when some of them become victims of the latest shark attack. Besides the ever-looming sharks, J.T. 's role is that of the jealous rival, who wants Danielle even though she is no longer interested in him, and does low life things, like putting a knock-out drops in Danielle's drink during one of the endless parties going on during spring break. 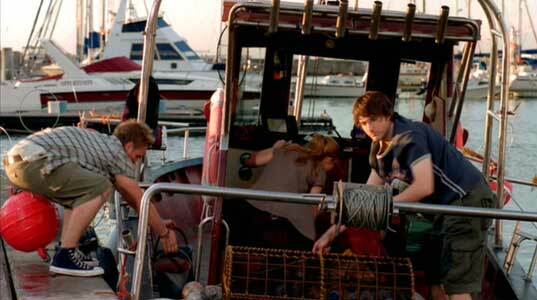 Danielle, JT and Shane sit on the boat. The main story revolves around two main threads. The first is the developing relationship between Shane and Danielle. There is an immediate chemistry that develops between the two of them that builds up throughout the film. Shane is there for Danielle when she is drugged by the insidious J.T. and helps get her packed off to sleep instead of to J.T. 's room. And later Danielle is there for Shane when the sharks are at their worst. The second thread is the environmental disaster happening at Seagull Beach. We find this out from Danielle's brother Max, who warns her (and the rest of us) that John Nately's new artificial reef has attracted so many fish that their natural predators have noticed. The area around the reef is now a fabulous feeding place for tiger sharks, and they don't care whether their dinner is seafood or partying kids in the water. One would think that the periodic shark attacks would draw a lot of attention and be an important part of the story line, but for some reason there is no hue and cry when these teens go missing in the water. It would spoil your experience to reveal much more of the somewhat threadbare plot, since films like this are enjoyed the most on the first viewing. After all, the title says it best and says it all. Danielle and Shane bring the boat to shore. Spring Break Shark Attack was originally a made for TV movie on CBS. Despite its flaws and limitations, the film succeeds in being entertaining because it gives limited portions of two genres that by themselves are nothing special, but in combination keeps our attention going for the duration. First we have the spring break party with romantic triangle. The lead characters, epecially Riley Smith, give credible enough performances so that we develop an interest and empathy for them as the story line shifts over to man against nature and the killer sharks. Because the rest of the characters are pretty much stereotypes, they often deliver dialogue that is (unintentionally?) humorous. Given the limited resources of a made for television movie, the producers have done some clever things in making the sharks believeable — lots of red water, fins circling in the water, and shaky camera shots of struggling teens. Director Paul Shapiro and writer James LaRosa deserve credit for keeping things moving and not too serious. Sure there are shark bites and gore, but how can you be too frightened when that is followed by this type of dialogue? Hot Girl: “Hey what's your name?” Max: “Crab Claws!” Think of Spring Break Shark Attack as a fun vacation movie. Just like a vacation, give your brain a rest, put your feet up, and enjoy the suspense and the fun. 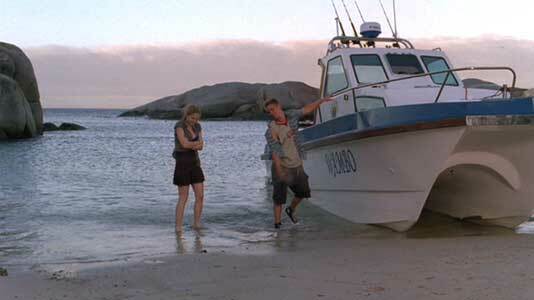 Shane and the university researchers set off in the expedition boat..
Riley Smith in his role as Shane wears black high top chucks without socks throughout the film. They give him a distinctive look from the rest of the scantily clad teens you see. Chucks are a practical shoe for Shane as he helps manage the boat rental company owned by his mom. They give his feet a lot more support than flip-flops or sandals, and are practical in and out of the water. 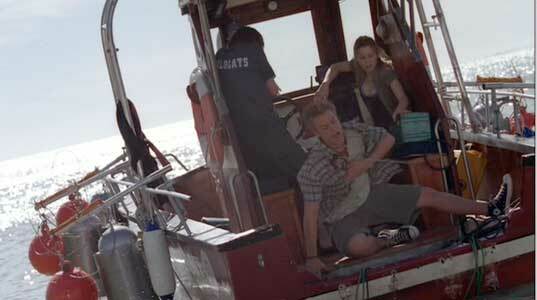 The best chucks scenes are when we seen Shane working on the rental boats. Shane is hit by a dart. Spring Break Shark Attack. (2005) Shannon Lucio, Riley Smith, Justin Baldoni, Bianca Lishansky, Genevieve Howard, Warren McAslan, Kathy Baker, Bryan Brown, Wayne Thornley, Wayne Harrison. Directed by Paul Shapiro. Categories: Drama, Action/Adventure.